Several of Charlotte de Rothschild’s earlier recordings have been well received by some of my MusicWeb International colleagues. These have included a release devoted to Miss de Rothschild’s ancestor, Mathilde de Rothschild (review) and, perhaps even more enterprisingly, a disc of songs by Japanese composers (review). There’s also been a themed recital of Fairy Songs (review) and a Christmas album (review). Miss de Rothschild, accompanied, as here, by Adrian Farmer, has also recorded a Schumann recital which included Frauenliebe und -leben (review). To the best of my recollection I’ve only heard her once before – and then only to a limited extent – contributing a couple of solos to an album of choral music by Gary Higginson (review). This full-length recital of mélodies by Fauré presents a challenging programme and reveals an accomplished singer who seems well attuned to the French master’s music. Her French pronunciation is pretty good and the words are clear, as is the sound of her voice. One or two caveats need to be made, however. To my ears there is a slight edge to Miss de Rothschild’s tone which is perhaps accentuated because the French language includes quite a lot of hard vowel sounds. I feel that her tone can harden under pressure, especially in her top register, so her softer singing affords the most pleasure. Also, as we shall see, there were occasions when I felt she had insufficient variety of vocal colouring at her disposal. a continuous stream of music in each song. I felt that, especially in the second and third songs, Reflets dans l’eau and Jardin nocturne, Miss de Rothschild doesn’t really offer enough variety of tonal colour; her voice sounds too unvaried in timbre. I turned to Gérard Souzay (review) and found immediately what I’d been missing in Charlotte de Rothschild’s singing. Here was a far greater range of colour and depth of tonal resource. Also – and one must acknowledge that Souzay is a natural Francophone – he simply does more with the words. His singing is much more characterised and he makes the songs more interesting. Charlotte de Rothschild also offers the much earlier set, Cinq melodies ‘de Vénise’. In Mandoline she puts across the gaiety and capriciousness of the song although I do sense perhaps a slight discomfort with the arabesques that decorate the vocal line at the end of a couple of stanzas. However, listen to Dame Felicity Lott in the first volume of Fauré’s complete songs in the Hyperion French Song Edition and you find greater vocal lustre and a wider range of vocal colouring (review). The languor of En sourdine is well conveyed by de Rothschild and by her accomplished pianist, Adrian Farmer; here the singer’s long sustained lines are admirable. She’s good at communicating the eagerness of Green but here and in À Clymène I hear a hardening of the tone in loud passages. Miss de Rothschild has a good feel for C’est l’extase but Felicity Lott’s voice has more sensuality and so can convey rapture so much more effectively. The centrepiece of the recital is the substantial cycle La Chanson d’Ève. When I compared Miss de Rothschild’s voice with that of Jennifer Smith, the soloist in the Hyperion series (review) Miss Smith’s voice registers as the richer instrument. 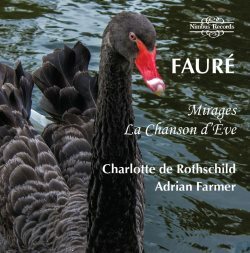 However, Charlotte de Rothschild’s less refulgent timbre is by no means inappropriate to these songs which are, after all, either about or the utterances of a young girl and, as elsewhere in the programme, she displays a good affinity with Fauré’s settings. She gets off to a strong start in Paradis where she sustains the long lines very well and conveys a sense of naivety and awakening. She puts the song across very well, singing expressively and with greater tonal variety than I’d observed previously. She’s also successful with Prima verba, where she and Adrian Farmer are alive to the essential – yet sophisticated - simplicity of the music. Roses ardentes is well done though the rising ecstasy of the music is just slightly compromised by the touch of hardness that I feel creeps into her tone at the end of the song. In L’aube blanche I think Miss de Rothschild gives us the sense of girlish eagerness and sensual discovery while I admire the delicacy which both singer and pianist bring to Crépuscule. The concluding song, Ô mort, poussière d’étoiles, is given with suitable gravity, rounding off nicely a successful account of this elusive cycle. The five remaining individual songs make a nice and varied postlude. Dans la forêt de Septembre is a fine song which is done well here while Le Don silencieux is, as Adrian Farmer says, a ‘little known gem’ and I was delighted by its inclusion. There’s a good deal to enjoy here. Charlotte de Rothschild may yield to such exponents of mélodies as Gérard Souzay and Felicity Lott but they are among the most distinguished exponents of French art-song that you could wish to hear. Miss de Rothschild brings her own accomplishment to these songs and there’s no doubting her commitment to Fauré’s music. The performers are nicely recorded with the voice well balanced against the piano. Adrian Farmer is not only a skilled and insightful accompanist but also provides excellent and enthusiastic notes about the songs.